Praise for Entrepreneurship For Dummies "A fantastic way to learn everything you need to know about successfully starting and operating your own business." - Karen E. Klein, Small Business Advice Columnist, Los Angeles Times "If you were born to be an entrepreneur (not everyone is), this book can help you succeed." - Joe Coulombe, Founder, Trader Joe's Company Discover the secrets of a winning business plan Get tips on attracting angel investors The fun and easy way" to turn your great idea into a money-making startup You've got a terrific idea for a new business. But how do you turn it into reality? This friendly guide can help. Packed with practical information and great advice, it shows you step-by-step how to become a successful entrepreneur, from putting together a business plan to orchestrating a marketing campaign. Discover how to: Brainstorm a business concept Draft a business plan Put together a startup team Choose the best legal structure Market yourself Manage growth and change Get smart! 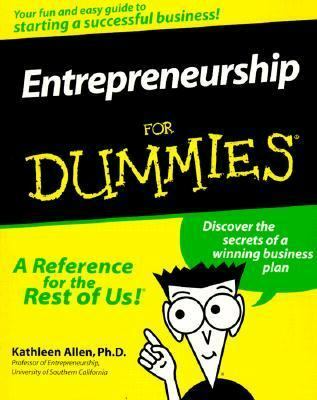 www.dummies.com Register to win cool prizes Browse exclusive articles and excerpts Get a free Dummies Daily" e-mail newsletter Chat with authors and preview other books Talk to us, ask questions, get answersAllen, Kathleen is the author of 'Entrepreneurship for Dummies', published 2000 under ISBN 9780764552625 and ISBN 0764552627. Loading marketplace prices 529 copies from $0.51 How does the rental process work?